Often considered as RETURN TO FOREVER's best album, "Romantic Warrior" is more avant-garde and less funky than the band's previous efforts. Featuring a more important usage of electronic keyboards and rocking guitars, the musicians also incorporated symphonic/heavy prog elements from bands such as YES or KING CRIMSON in their music. Combined to the strange and charming synthesizers of Chick Corea, the result is quite original and inspired, while remaining accessible. The question is: what's the relation with the title? "Medieval Overture" (by Chick Corea) is in fact not really medieval. Instead, this composition is a rather retro-futuristic spacey jazz/rock with various keyboards in the style of YES. Very nice, and sets the tone for the rest of the disc. Lenny White's "Sorceress" is the funkiest track of the record. Opening with a calm and groovy bass line, it contains a few guitar and keyboards interventions with a slight flavour of McCoy Tyner. In contrast, the title track (by Chick Corea) is fully acoustic. Majestic and delightful, however a bit too long. Only after the listen can you understand the album title. 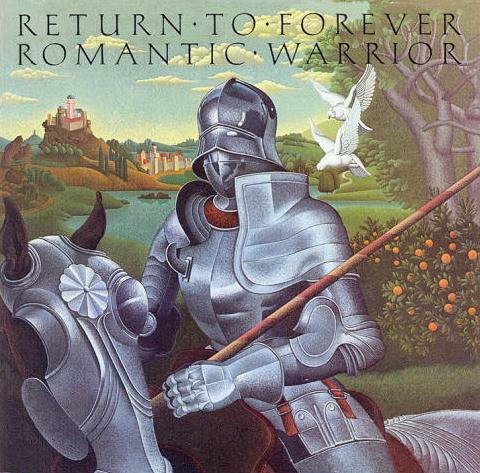 "Romantic Warrior" do not naively refer to love or martial metal songs. Instead, it should rather been taken as an oxymoron that corresponds to the musical style: both calm and turbulent, light and ferocious. Everything is a matter of contrast. Unusual, original and with an unique sound, this 1976 opus is one of the proggiest and greatest achievements of its genre. Very recommended to jazz rock / fusion aficionados or hard rock fans wanting to discover the style!